Life’s little luxuries – and how you can get in on it too! A little luxury every now and then never hurt anyone. In fact, treating yourself next time you go traveling may just be what the doctor ordered. 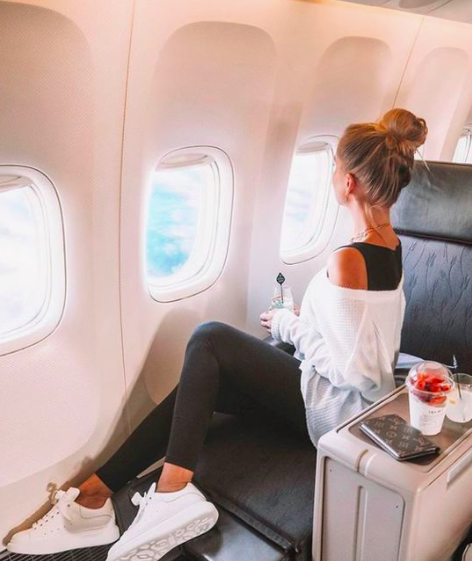 Upgrade your flight and you’ll upgrade your life (at least for a day), and guess what, it’s not just for the rich and famous. It always seems as though a business class flight is a luxury for just a small few. If you have ever traveled more than 7 hours to a destination, you know the feeling of desperately wanting that flatbed and comfy duvet to send you off for some much needed R&R. But how do you get there if your wallet doesn’t seem to match the costs? Look for great deals with great airlines, that aren’t as well known. For example, I did some research and found that Royal Brunei Airlines was rated highly and similar to other airlines such as Etihad and Emirates. You can check all airlines out on flight-report.com. This less well-known airline has fantastic customer reviews and tends to be lower cost than other airlines. Another option is to save points on your credit cards. There are some great credit card options out there which allows you to spend and earn points for flights. So if you do have a credit card, it might as well be one that earns you points, save up the points (miles) and upgrade your next flight, without actually spending more. Lastly, my other final tip for upgrading your flight is to signup to travel websites that send you great deals. Try Scottscheapflights.com – here you can fly for a fraction of a regular flight, and potentially purchase a one way via Scottscheapflights.com on an economy seat and your return flight you can spend the savings on a business class – win-win! So once you have chosen the best way to get on your flight, lets discuss the benefits. If you have a long distance flight, as I did from London to Melbourne (over 23 hours of flying), you will appreciate being in business class. Start your flight with a delicious meal, a book and perhaps a good movie. You know that over 14 hours of just the 1st leg of the trip is coming up, so whatever it takes to entertain yourself until you feel sleepy is fair game. The luxury of sleep cannot be underestimated. Allow the Royal Brunei Airlines cabin crew to make up your bed, deliver your plush slippers, and lay back and enjoy 14 hours of bliss. The flatbed is so delicious, with your duvet and fluffy pillow, you’ll wish you had a longer flight. If you haven’t flown business class before, you’ll feel giddy with happiness. Want to skip dinner and just sleep? No problem. When you wake up, just ask for your meal – nothing is too much trouble in business class. The Royal Brunei Airline staff really do live up to their reviews on the flight-report.com, they are polite and actually pretty sweet. In fact, even if you have eaten dinner, bit still bit peckish, just ask for a snack or a cup of tea, really there’s not much they can’t help you with. There are also additional perks even when you’re not on the flight – for example, you are the first to get on and off the flight, there are fast-track, business class queues when you’re lining up through passport control, and a premium members line when passing through security. All of which makes travel life feel that much easier. Another added plus is the business class lounge, so before you even step on the plane, you’re well fed and well read, especially if there are any delays. If you have an extra long haul flight, e.g. London – Melbourne, which is over 23 hours, the lay-over business lounge is by far the best place to be. Overall, all these little details help you to feel less stressed, well rested and ready to tackle any destination in any timezone. When you’re well rested, you’re feeling great and ready to explore a fantastic world out there.